Pickguard Bound "Tortoise" Pickguard with metal "E"
The inspiration for the ES series had its roots in Les Paul’s infamous “Log” guitar, built late at night in at Epiphone’s New York City factory just before the start of World War II in 1941. Les' “Log” was made from Epiphone parts and a 4" x 4" piece of pinewood. The feedback-resistant qualities of the ES-335 were combined with historic Epiphone inlays and cosmetics to create the first Epiphone Sheraton in 1959. 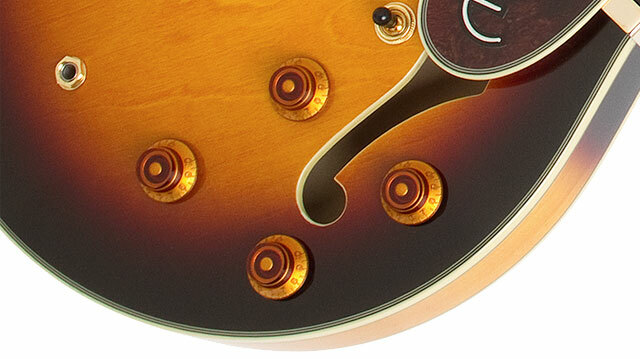 While the original Sheraton featured a split-trapeze Frequensator™ tailpiece, our Sheraton-II features a Stopbar tailpiece for improved sustain. The Sheraton II is voiced with a pair of Epiphone's Alnico Classic™ Humbucker pickups for authentic vintage tone, the Sheraton II is constructed with a gorgeous maple neck and a traditional laminated body with a mahogany center block for amazing tone and sustain that works well every musical genre from Pop to Rock to Blues to Jazz. 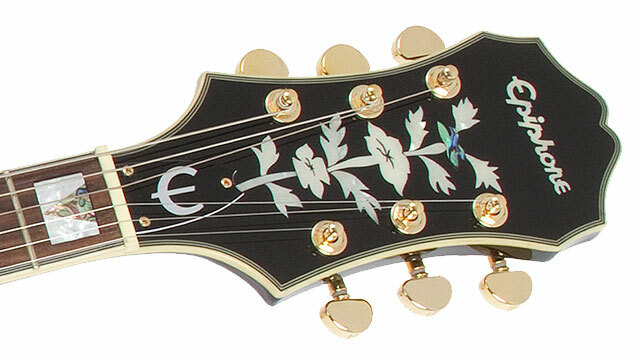 Other details include a rosewood fingerboard, quality electronic parts including full-size, 1” 500K Ohm potentiometers, Epiphone's all-metal pickup selector switch, the historic "Tree of Life" headstock inlay with "Block and Triangle" Pearl/Abalone fretboard inlays, and a heavy-duty output jack. The Gold hardware includes Grover® machine heads for superior tuning stability and Epiphone's exclusive LockTone ™ locking Tune-o-matic bridge and Stopbar tailpiece for increased sustain.